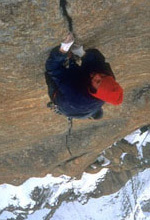 In 1994, Todd Skinner held a meeting of a select team of highly trained rock climbers to assess the free climbing potential of every rock feature in every major range of mountains in the world. "Free climbing" refers to the pure form of rock climbing where climbers use only the natural features that the mountain presents in order to climb, as opposed to "aid climbing" where climbers use various types of ladders to ascend. Skinner and his partners considered walls on mountains in ranges on every continent and in every climate. In they end they decided that the world's ultimate free climbing challenge would be the East Face of Trango Tower, the most dramatic feature in the Trango Group, a series of rock spires rising from the Baltoro Glacier in Pakistan's Karakoram range of the Himalayas. Trango's altitude, verticality, and sustained difficulty would call for a level of free climbing performance that had never been seen in the great and remote ranges of the world. The team flew to Islamabad in June of 1995. They spent five days buying rice, flour, spices, kerosene, lanterns, and basecamp stoves and arranging for transportation to the north. From Islamabad they traveled by truck for 24 hours up the Indus River valley to Skardu. Here the team hired half of the 80 porters that would be needed to move the four thousand pounds of food and equipment to the base of Trango Tower. Jeeps were used to travel another fifty rugged miles to the end of the road in the mountain village of Askole. Here they hired the remaining porters, divided the gear into fifty-pound loads, and bought a goat to eat at basecamp. Three arduous days of walking from Askole up the Baltoro Glacier brought them to basecamp on Trango Glacier. 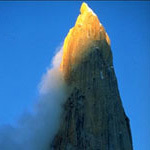 The team formulated a comprehensive plan for the actual climb and the complex support logistics. Food and tents were moved to Notch Camp at 17,500 feet. From here, the first technical climbing was encountered on the way to Shoulder Camp at 18,500 feet. The final camp was in hanging tents at 19,500 feet - 2,000 feet above the glacier. 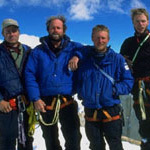 The team originally planned to live for only fifteen days on the Tower's upper wall, but storms and the most difficult climbing yet found in the Himalayas required that they remain for sixty days at 18,500 feet or above. The upper wall is the heart and soul of the East Face, and all of the training on the previous walls was preparation for this section. Skill, discipline, strength, and luck were reduced to supporting roles for the only trait that is ever truly rewarded in life or in wall climbing: tenacity. The Wyoming climbing team became famous for tenacity above all else. Skinner's four early free climbs in North America were featured in Life magazine and the acclaimed Sierra Club book Big Walls by Paul Piana. 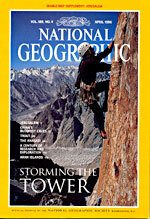 The Trango Tower expedition was the cover story of the April 1996 issue of National Geographic.